In late February, Adam Griffith and I were fortunate to participate in an overflight of the Barataria region on a flight donated by LightHawk. 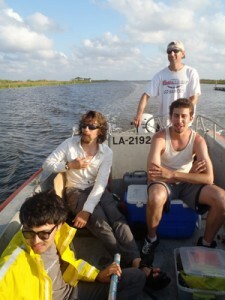 Other flight participants included Dr. Alex Kolker and Alex Ameen of the Louisiana Universities Marine Consortium. We were interested in similar sites as Alex and Alex from LUMCON, including Bay Jimmy and Isle Grand Terre which Grassroots Mappers had mapped during the previous summer (2010). Public Laboratory community member, Cesar Harada, had also worked with Adam just a week earlier to begin figuring out a process for quantifying wetlands and thus with these tie-ins, we decided to keep in touch with Alex and Alex and see what kind of cross-over we might have in future work. In early April, Cesar and I met with Alex and Alex at Tulane University and arranged fieldwork dates for May that fellow PLOTS staff members, Jeff Warren and Adam Griffith could participate in as Jeff has been developing and testing infrared cameras and Adam is a coastal environments specialist. 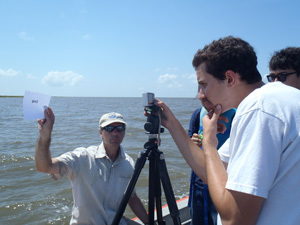 On May 10th and 11th we spent two days in Barataria mapping, testing out infrared and UV cameras and trying out a new aerial mapping rig with dual Infrared and visible light cameras next to each other. We also worked with Alex and Alex to measure shoreline distances and to duplicate the images that they were taking with regular cameras with both UV and Infrared cameras (stitched images coming soon!) that PLOTS has been developing. On the 12th we spent a day in Grand Isle State Park, testing out new kite rigs and determining if, with a combined aerial and ground image approach, we could get accurate counts on bird species on a jetty of land. Experimenting and collaborating with researchers- is part of the PLOTS outcomes that we have been working towards. In this instance of partnering with LUMCON, we were particularly interested to see how aerial data collected and generated by residents of the Gulf Coast could be useful to Gulf Coast researchers. During the last year, we have continuously worked with media outlets to spread the images collected of the Gulf Coast as many images showed the impact of oil on areas as the spill period progressed- not always evident from ground imagery. Going forward, a year after the spill, we are interested in looking at the ways that baseline aerial-data collected of areas where researchers are still working can be useful in when looking at shoreline impacts from oil, as well as the continued problem of wetland loss. We will continue collaborating with LUMCON in the future, testing out infrared and UV cameras, refining processes of wetland quantification, and aerial mapping over impacted sites such as Bay Jimmy that both PLOTS and LUMCON have used as sites in our work. We’ll also be starting with the development of a time lapse camera that we envision testing over the course of a year in several different wetland areas of Louisiana, including the LUMCON headquarters in Cocodrie, LA. As always…If you are a Gulf Coast resident and interested in getting involved in working with PLOTS, please contact Shannon@publiclaboratory.org.